There's a Grand Opening Offer on at the new property, through April 30, 2018. There's a Grand Opening Offer on, through April 30, 2018. GRAND OPENINGS, as a rule, can be quite splashy, and future-looking, and laden with possibilities, but they do have a way of wrapping up within a matter of hours. Once the ribbon is cut and the glasses are raised and the speeches are given, the decorations come down and it is onward to the daily business of, well, running a business. A hotel is rather different here, however, for once that kick-off occasion passes, the celebratory spirit can be passed along to the first guests, and that get-things-started vibe can flow on for several days. 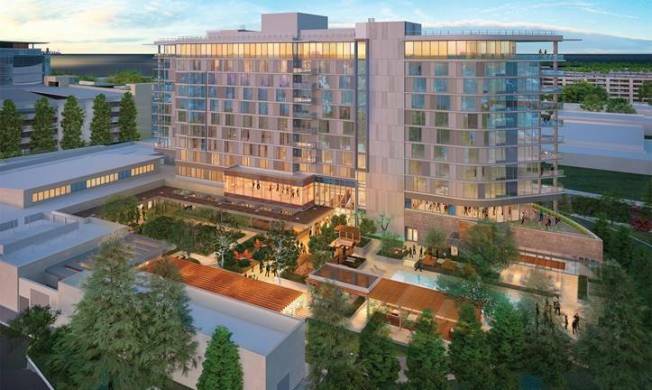 Such is the case at the brand-new Hotel Nia, from Autograph Collection Hotels, which just opened in Menlo Park earlier in the spring of 2018. THE HOTEL, which has 250 guestrooms and nine suites, has a pool, a "state-of-the-art fitness center," and, Porta Blu, a restaurant specializing in Mediterranean cuisine with some NorCal flair. And it also has a special on, one that could appeal to both locals needing a quick getaway as well as those travelers swinging through the valley on business (or visitors calling upon the region's great, highly strollable public gardens, just when they're at their springtime bloomiest). AS FOR THAT OFFER? Book it by April 30, 2018 and "... receive 20% off our best weekend rate," and, of course, get the chance to "... experience Silicon Valley's newest hotel for yourself." For details on the deal, and to have a look around the property, from its pool to its custom-designed furniture to the swanky Hotel Nia suite, click.